I think perhaps the invite arrived inadvertantly, but I wasn’t going to pass up the opportunity to attend the press preview of Tate Liverpool’s new exhibition Glam! The Performance of Style. I had sat in on a research event back in the Autumn last year, where I listened to some prickly debates about whether or not it was going to be appropriate to curate both fine art and pop music. I left that event a little concerned, but I needn’t have worried. The exhibition makes for both a sophisticated and lively blend of media, domains and tensions; without pandering to the spectacle of nostalgia (it will be interesting to see if the V&A’s forthcoming David Bowie Is can achieved something similar). 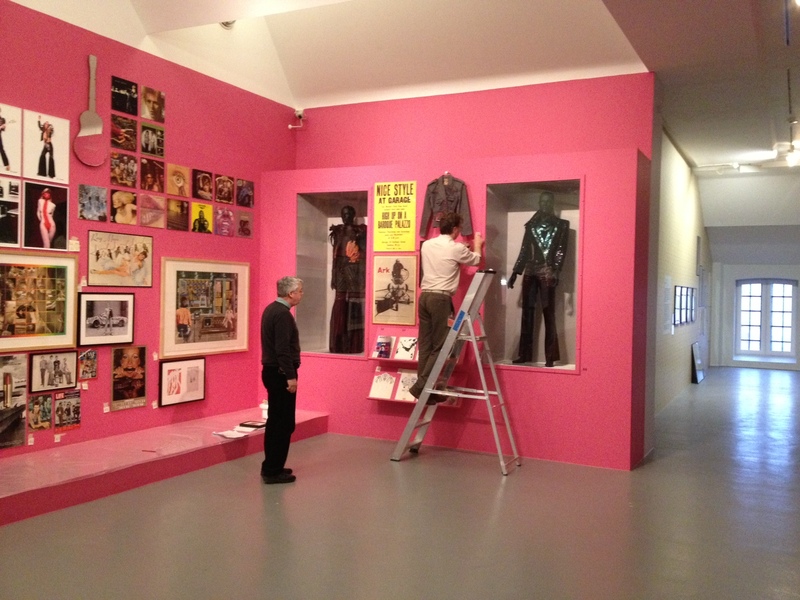 On entering the gallery I adjusted to the shocking pink walls adorned with a range of 1970s ephemera and glittery costumes. Somewhere in the distance yowled Bowie, and all around was the light clatter of technicians busily setting right various displays and finalising wall texts. The exhibition’s curator, Darren Pih, admitted to being a little stressed, yet displayed nothing of the sort. 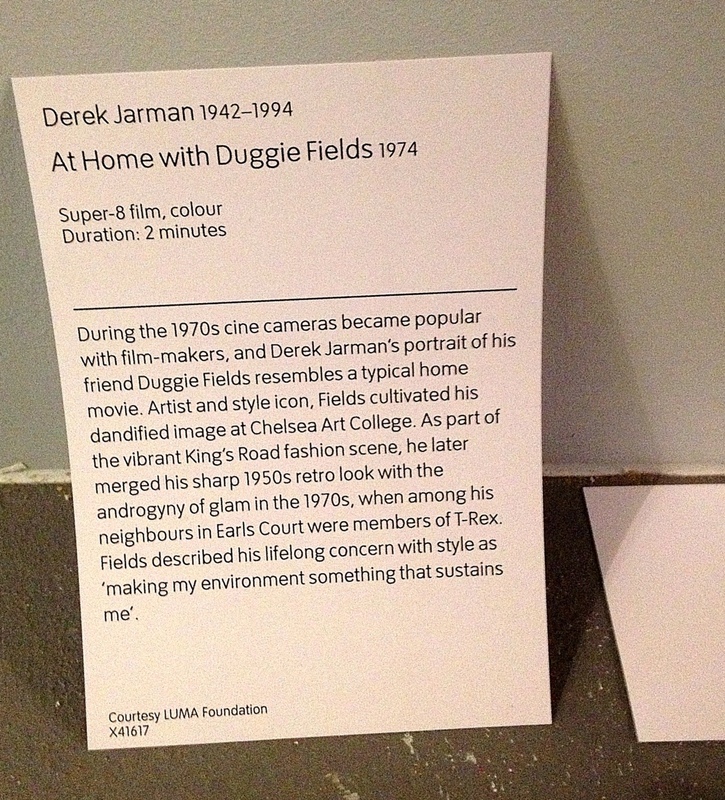 We talked briefly of a glorious Jarman super-eight encountered in the first room, which immediately calibrates the subtle intentions of the exhibition as a whole. It isn’t simply that fine art informed other areas of practice. Glam as ‘convergence culture’ was genuinely the experience of convergence, or perhaps more appropriately divergence; shifting the very locus of art well beyond its known parameters, so making this exhibition (in a gallery) ever more challenging and significant. Coolly and quietly walking through the rooms during the preview was the critic Paul Morley. His appreciation of Glam is known to anyone who has read his music journalism (or more recently his book Words and Music). He was there as part of the BBC’s Review team, and sure enough the following evening appeared on TV along with the show’s presenter, Martha Kearney. The two of them initially joked about the opening room looking exactly like their teenage bedrooms. It is clear the exhibition tugs on the heart strings of anyone who lived through the period. Morley has always been an incisive critic of nostalgic obsessions, particularly within the domain of pop culture and music. Yet, in speaking of this examination of Glam, he was keen to acknowledge its intellectual approach. My TV set was still black and white when Glam came to dominate Top of the Pops, but that did nothing to prevent the colours shining through. I vividly recall having to change channels with a dial not a switch, yet I must admit Glam was – if not such a distance experience – always only a vicarious thrill. From where I stood, Glam was all about transgression (even if I didn’t know such a word then). Like punk, which was to follow, Glam was the manifestation of a contest not in overtly political terms, but in cultural, aesthetic forms. Yet, unlike punk, the transgressions of Glam were not rebarbative, but about new and alternative forms of beauty, pleasure and ambiguity. What was deeply satisfying upon entering the exhibition, I found myself still confronted with such transgressions. That’s what makes its curation so important. Interview: Darren Pih on Glam!